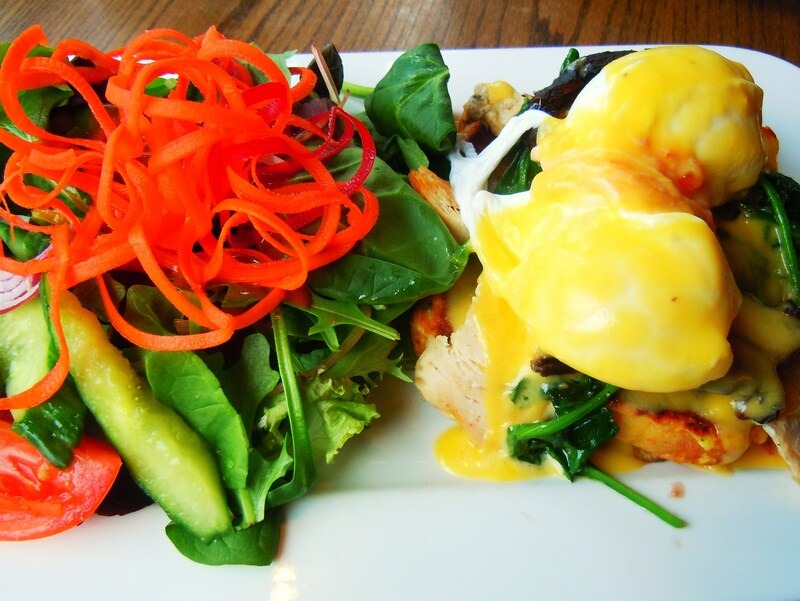 The Weekend Brunch Series – Savoury Eggs Benny French Toast & Chocolate Chip Pancakes at Brownstone Bistro! 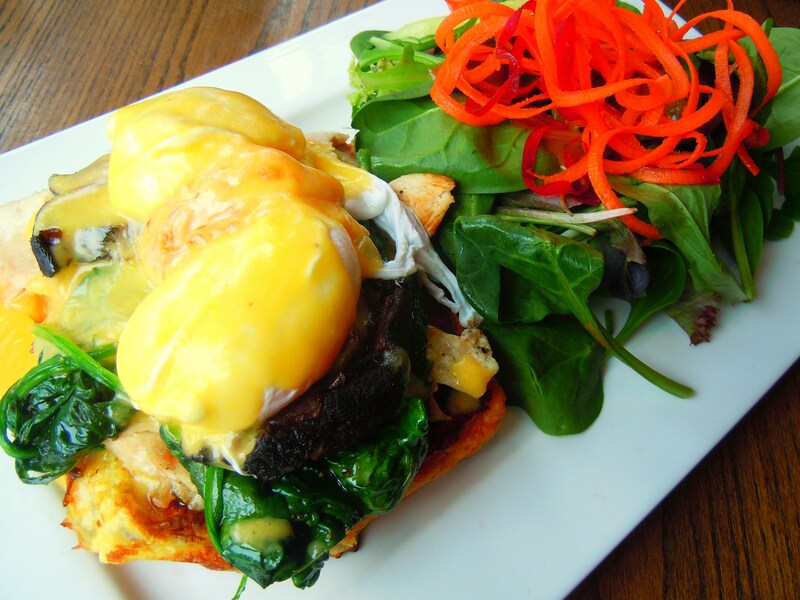 I must have the best luck scoping out awesome and fantabulous brunch spots. I have yet to have a meal that has fallen flat or to find a place that has let my spirits down. Cupcakes? Sure, I’ve had a few duds. Sushi? I definitely have my favourites. But weekend brunch? Oh gosh, that’s a toughie. I fall more and more in love with each and every single eatery I come across in the city and the meals just keep tasting more delicious and scrumptious. I thought for sure my beloved poached eggs and egg benny dishes couldn’t get any more amazing (places like Brockton General, the Gladstone Hotel and Wish Cafe set the weekend brunch pretty damn high already in general!) but I thought wrong because Brownstone Bistro, located at 603 Yonge Street just north of Wellesley Street with Irwin Ave. to the west and Gloucester Street to the east(really, it’s a hop, skip and step away from Wellesley subway station) has captured my brunch-loving heart and I almost can’t even find the words to describe how wonderful their weekend brunch is. Seriously, if anyone is looking for an accessible brunch spot to hit up (it’s right on Yonge Street, it’s so close to the subway, their brunch hours are from 10am-4pm which would really fit into anyone’s eating schedule, and located within the downtown core for those who don’t prefer venturing too far north, east, or west – you know who you are! ), Brownstone is THE place. Hell, I would even drag folks up in Newmarket to come down here to have a meal. It’s that freakin’ terrific. 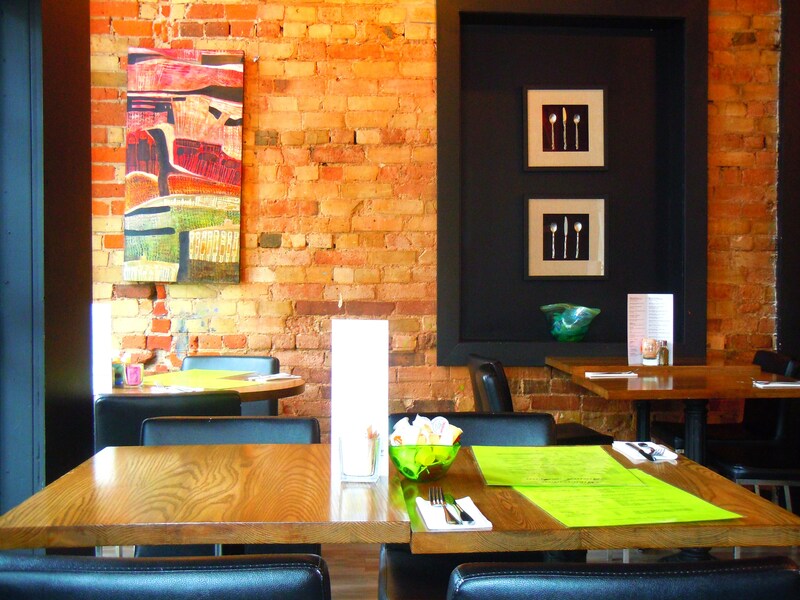 Not only does their brunch menu boast a mosaic of brunch dishes for sweet and savoury cravings, their prices are incredibly reasonable. For those who enjoy weekend brunch on a regular basis, you know you’ve grown accustomed to seeing brunch prices hit $14-$18, in the sense that this price range doesn’t really surprise or faze you because it’s common at a number of spots throughout the city; it’s not shocking anymore. 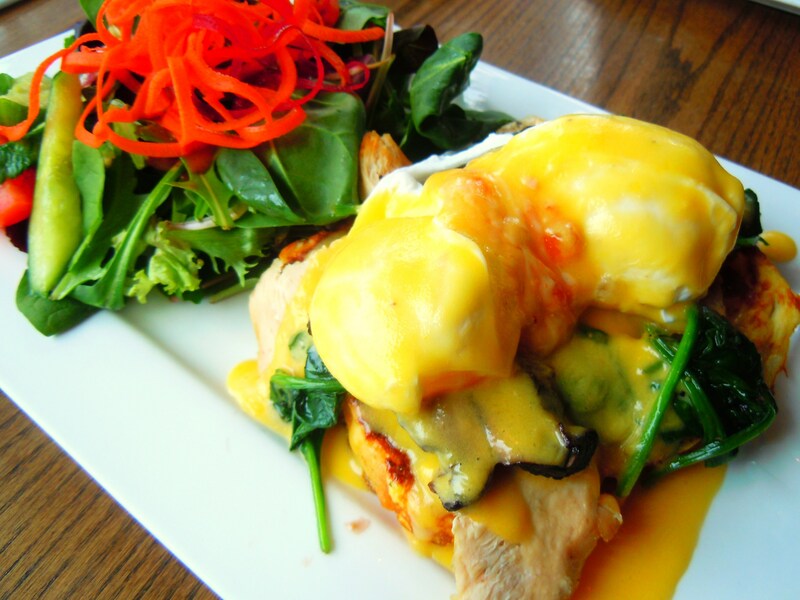 At Brownstone Bistro though, you can get a belt-popping, belly-filling brunch for $10-$12 and the choices are things you just wouldn’t find anywhere else. OH! 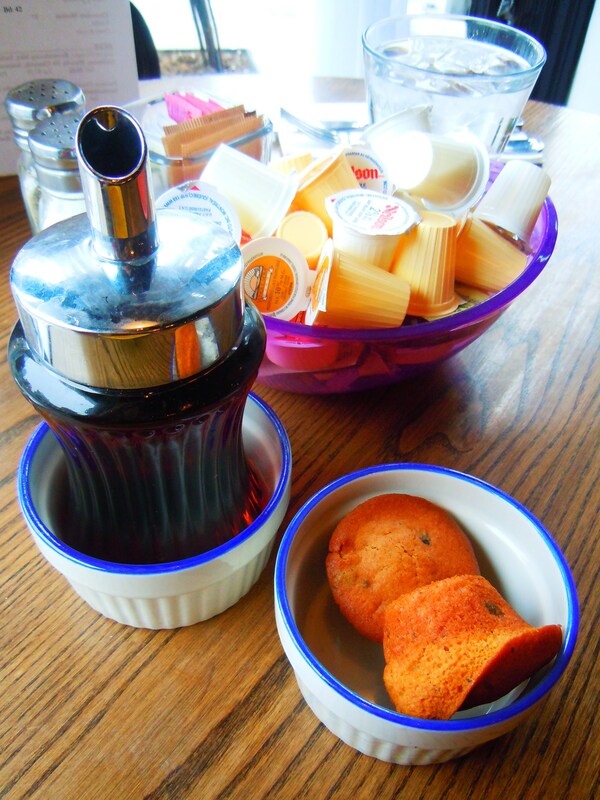 And did I mention they give you complimentary fresh-out-of-the-oven mini muffins?! SWEET! They are delightful not just in appearance (so cute!) but also because they’re warm and yummy and all sorts of comforting. Thinking about mini muffins always make my brother and I laugh because we always think back to the hilarious F.R.I.E.N.D.S. episode where Ross so desperately wanted Ugly Naked Guy’s apartment across the street and he thought he could sway him by giving him a basket of mini muffins. Ross: “Someone sent us a basket at work once. It was the happiest day!” Chandler: “Your work makes me sad”. Haha! They’ve divided up their brunch menu into sections: classics and omelettes, eggs benny and healthy choices, sweet dishes, and signature brunch entrees which is where you’ll find really unique stuff with the Brownstone Bistro stamp of delicious approval: savoury French toasts and souffles, stuffed peppers brunch-style, and even a hashbrown and scambled eggs casserole au gratin! Even their classics have a twist: wild mushroom and mozzarella omelettes with basil; grilled chicken and guacamole omelettes with pesto; and egg breakfasts with spicy Italian sausage. And beyond their brunch dishes you have lunch fare such as soups, salads and sandwiches for those who don’t prefer brunch food quite so much. While I would never go this route, I totally understand that not everyone is a brunch-obsessed nut like me! My boyfriend and I shared about 1/3 of our brunch with one another (you’ll understand why we did 1/3 in a bit) because we just couldn’t decide which one we truly wanted more! I snatched up the scrumptious, mouthwatering Grilled Chicken & Portobello signature dish ($12) which was comprised of juicy strips of grilled chicken and portobello mushrooms with spinach on piece of thick cut French toast with two poached eggs, smothered in hollandaise sauce (OH YES) and served with a mixed green salad with balsamic dressing, while my boyfriend took on the Chocolate Chip pancakes served with whipped cream and fresh fruit ($10). Let me start with my yummylicious savoury French toast. 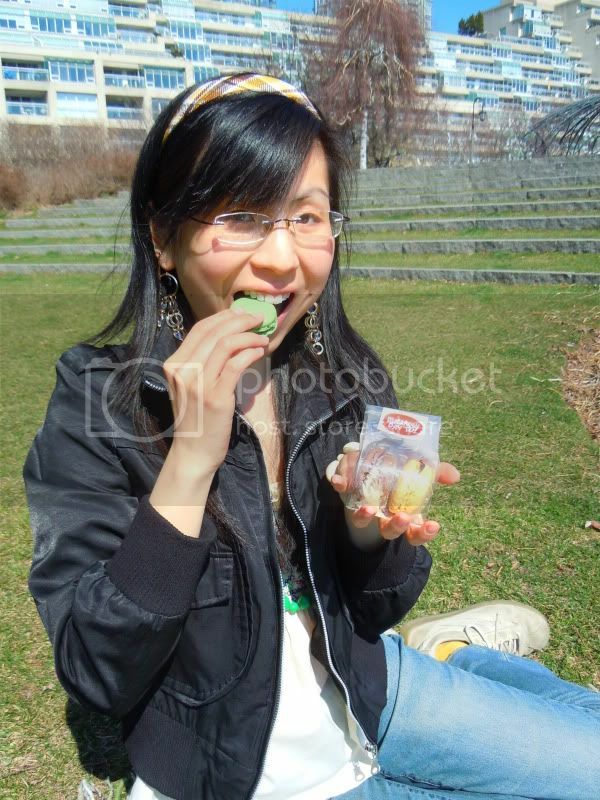 It makes my mouth water just thinking back about it! 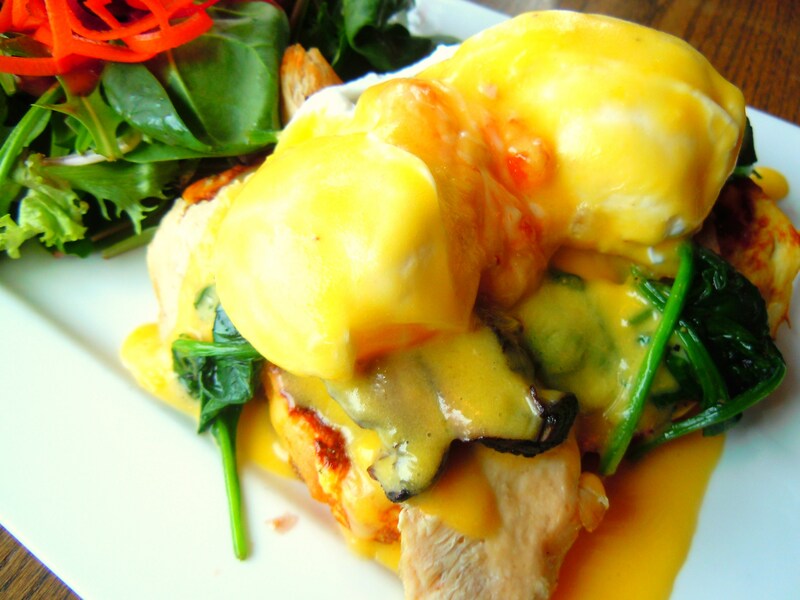 The grilled chicken and hollandaise make this dish. And of course the poached egg yolks! The grilled chicken is so tender (not a bit of dryness or toughness in sight), the portobello mushrooms are savoury and juicy and the hollandaise sauce and yolks that spill out of the poached eggs make for amazing dipping for the grilled chicken and French toast! The French toast and grilled chicken soak up the sauces so you get all tender juiciness in every bite. You never have to worry about your meal getting dried out or being left with too much of one thing. The savoury flavours that come together are incredible and remarkably, you get those meaty textures and flavours from the grilled chicken and portobello mushrooms without the heaviness. Their mixed green salad is delicious, bringing everything together and keeping the dish fresh and lightening it up. 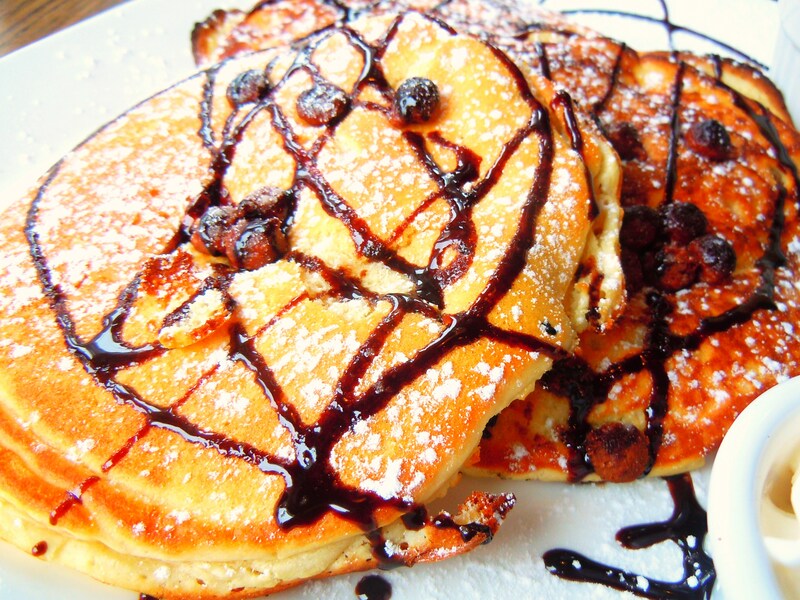 And then there’s the chocolate chip pancakes! I enjoy pancakes, I really do, and often times I’ll want them when I go out for weekend brunch. But let’s face it. Nobody likes dry pancakes. Or pancakes that are too thin or too thick or pancakes that just completely lack in flavour. But Brownstone Bistro’s pancakes are FANTASTIC! 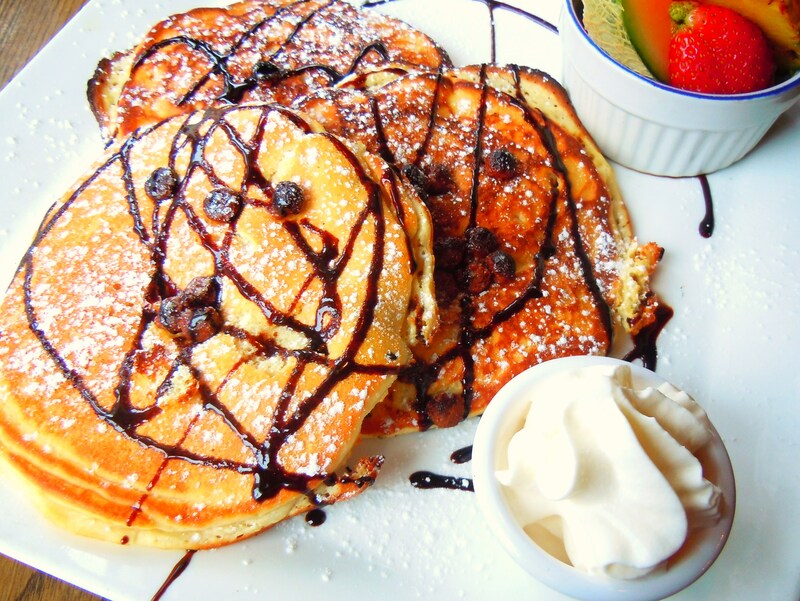 The pancakes come in a set of 3, were studded with chocolate chips, drizzled with chocolate sauce and dusted with icing sugar with whipped cream and fruit on the side. And do you know why their pancakes are so great? Because you don’t need maple syrup with them. Yes, pancakes taste yummy with maple syrup, but you know a pancake hits the nail on the head when you don’t NEED maple syrup to eat them. When you can scarf them down without maple syrup and they still taste delicious. If you need to douse and down your pancakes in syrup just to make them edible, you know the pancakes don’t cut it, but if they hold up on their own, you know you’ve got some awesome flapjacks. I’ve taken my family here since this meal and they loved it to pieces too. Love for Brownstone Bistro all around! 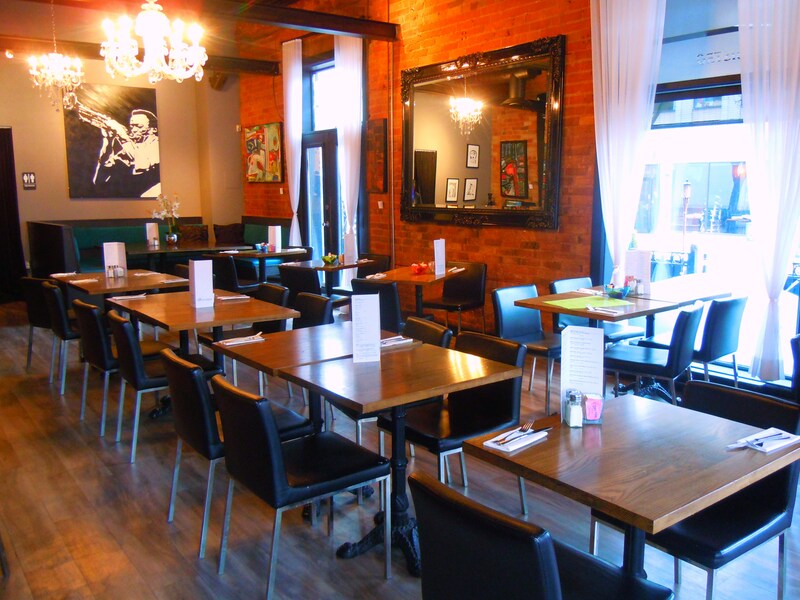 Brownstone Bistro is located at 603 Yonge Street by the corner of Gloucester Street on the east side of Yonge, north of Wellesley Street and just steps away from Wellesley subway station. 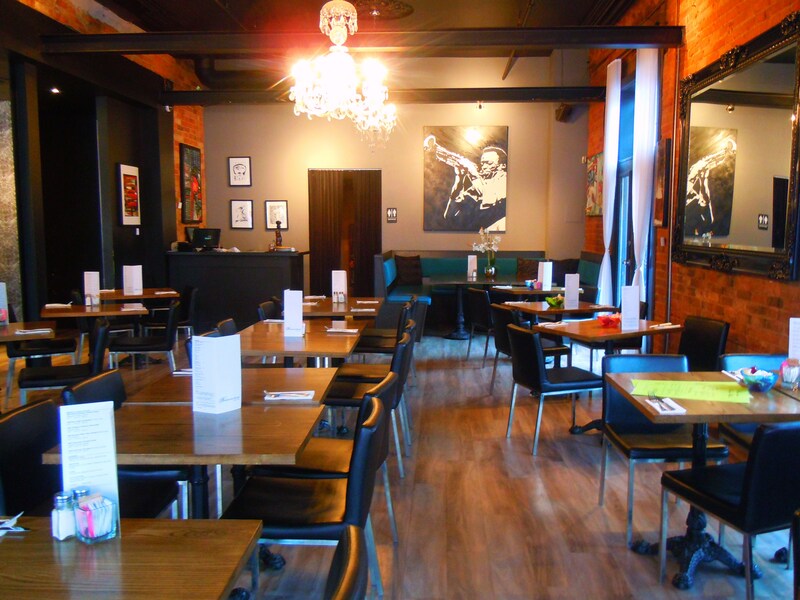 They are open from 11am-11pm Monday-Thursday (lunch and dinner), 11am-12am Friday (lunch and dinner), 10am-12am Saturday (weekend brunch and dinner) and 10am-11pm Sunday (weekend brunch and dinner). They also offer a theatre menu too!